0 Comments Published by KL Ocs Kid on Monday, August 20, 2007 at 5:10 PM. Jose Mourinho sparked another war-of-words with Liverpool boss Rafa Benitez when he insisted his side had 'no divers'. 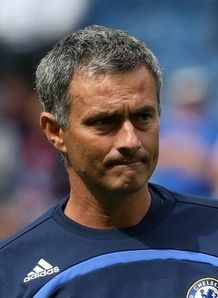 The Chelsea boss claimed referee Rob Styles was right to award the Blues a hotly disputed second-half penalty at Anfield. Styles harshly adjudged Steve Finnan to have fouled Florent Malouda inside the box even though it appeared that the Chelsea winger had made the most of the challenge. But Mourinho jumped to the defence of the French international and insisted he had done nothing wrong. "I have not seen it on TV so I was 30 metres away," Mourinho told The Sun. "Malouda opens his legs to let the ball run and he is brought down from behind - I think it's a penalty. "Do you think my players surround the referee? I have a naive team. We do not have any divers, no violent people, we do not have any nasty tackles. It's a pure team." But an angry Benitez responded after the 1-1 draw by saying: "If that's the case then I'm Little Red Riding Hood! "You can check his team and I think how many times they do and say the things they say they don't do. "There have been a lot situations in the last three years. The players were talking to the ref the whole time." And the Liverpool boss felt Styles had got it wrong when he awarded Chelsea their second-half penalty: "I want to have respect for the referee but only he can explain - but he will not be able to explain properly. "There were 45,000 people here and they could not see a penalty. That is why Jose Mourinho could not see it." Who Will Start Against Chelsea?